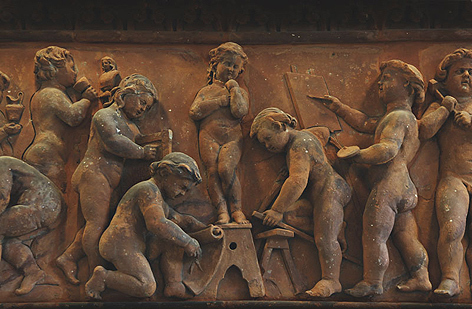 Image: The Arts terracotta panel from the main facade of the 1877 building in Grand Parade. It was, with its scientific counterpart, designed by Alexander Fisher, manufacured by Messrs Johnson, Ditchling, 1877. These can be seen in situ in the College of Arts and Humanities Grand Parade foyer. Deliberations about the nature and purpose of art and design education in Britain were aired increasingly in the second half of the eighteenth century with the involvement of bodies such as the Royal Society for the Encouragement of Arts, Manufactures and Commerce (RSA). Founded in 1754, it held its first exhibition of contemporary art in 1760 and first industrial exhibition in 1761. However, as the impact of manufacturing on a significant scale became increasingly widespread, in the face of growing economic competition from in Europe in the early decades of the nineteenth century attention moved from the technical to the aesthetic quality of British manufactured products. British goods were increasingly perceived to be lagging behind their continental competitors in terms of design, resulting in greater attention being paid to the provision and delivery of art and design education in Britain as a potential means of redressing such shortcomings. As a consequence, debates focussed on the national importance of art education gathered pace during the 1830s, boosted considerably by the publication of the 1835 Parliamentary Select Committee’s Report on Arts & Manufactures and the ensuing establishment of the Government School of Design in Somerset House, London, in 1837. Also noteworthy in this context was the 1849 Select Committee’s Report on the School of Design. All of these considerations provided the impetus that was to result in the establishment of the Brighton School of Art. In the decades immediately after the end of the Napoleonic Wars, there was increasing activity in the realm of adult education in Brighton. An important figure in this movement was John Cordy Burrows, a surgeon and local politician who went on to become Mayor of Brighton three times and receive a knighthood. Having moved to Brighton in 1837, he soon became closely involved in a number of philanthropic and educational initiatives in the town, including the founding of the Literary and Scientific Institution in 1841 and the establishment of the Brighton Mechanics Institution, for which he was Secretary from 1841 to 1857. He also brought about a number of aesthetic and sanitary improvements in the municipality, but perhaps of most significance in the context of art education in Brighton was his membership of the Town Committee that bought the Royal Pavilion from the Commissioners of Woods and Forests for £53,000 in 1849. The Pavilion was to provide the first premises for Brighton School of Art ten years later. The grand object is to instruct working people to do their work better by turning it out of hand neatly and handsomely as well as usefully, and thus enable them to command the best price for their labour, and to compete more successfully with the foreign workman, who, in these days, when the public require some sort of ornament and elegance about the commonest article, in many cases beats the English workman out of the market. Only four months after the August 1858 public meeting, on Monday 17 January 1859 Brighton School of Art opened its doors to more than fifty pupils and was situated in a room off the Kitchen provided by the Town Council at a rent of £26 per annum. The first Art Master was John White who brought with him experience of a similar post at Leeds School of Practical Art, as well as certification as a Teacher of Drawing and Painting from the Department of Science and Art. He had also attended the Central School for the Training of Art Teachers in London. At this early stage of Art School life at Brighton, John White ran classes for several different constituencies: those of independent means who attended the Day Classes and were segregated by gender; artisans who were provided with evening classes at a low fee rate; and teachers, for whom fees were lower still. It has proved difficult to unearth the First Annual Report (1859), with the consequence that a range of detailed information is limited for that year. However, the Second Annual Report for 1860 provides an illuminating overview of the School’s student profile, accommodation, finances and public presence, a picture that largely typifies developments at the Brighton School of Art in the eighteen years leading up to its move to purpose-built premises in Grand Parade, Brighton, in 1877. Clearly, the first year had witnessed a number of teething problems as evidenced by a public meeting held on 21 January 1860, little more than a year after the School first opened, and at which the institution was constituted on a formal basis. The composition of the student body was clearly a bone of contention as a motion was proposed ‘to confine the operations of the School to the artisan classes’. This was strongly opposed by the School Committee which was of the view that their institution should be open to all classes, commenting that ‘without the fees paid by the wealthier classes it would be impossible to extend the benefits of this School to the large numbers who receive almost gratuitous instruction from the Art Master’. In 1860 there 58 students attending the fee-paying Day Classes: 17 gentlemen and 41 ladies. 167 attended the Evening Classes: 99 artisans, 8 schoolmasters and male pupil teachers and 60 schoolmistress and female pupil teachers. However, John White’s responsibilities also covered national and public schools: including 46 pupils from Chichester, these numbered 816, with the grand total of all students amounting to 1041. Drawn from the community, artisans were of considerable importance to the School and remained so until the mid-1970s when the then Brighton Polytechnic (of which the School of Art was a founding constituent) transferred almost all of the trade courses to Brighton Technical College. In 1860, the artisans registered for classes at the School numbered 17 joiners and carpenters, 16 assistants to architects, builders, drapers and others, 5 engravers, 4 masons, 3 cabinet makers, 3 carvers, 3 printers, 2 millwrights, 1 pastry cook, 1 silversmith and 1 mechanical dentist. This wide range of professions proved to be in line with the findings of the Select Committee Report on the School of Art of 1864. During 1860 - out of class hours and in the summer vacations, four days a week from 10.00am until 4.00pm - the School was open for study by students of the School, free of charge. In line with the Committee’s commitment to make the School as widely accessible as possible, this opportunity was taken up by a large number of students and was soon extended to artisans and teachers. Other members of the public could also take up the offer on payment of 2 shillings per month, 8 shillings per session, or 15 shillings per year. Problems of space reared their head in 1860, a feature that was to reappear regularly through much of the rest of the institution’s history. The municipal authorities, effectively the School’s landlords, allocated two new rooms to the School in the South-West corner of the Pavilion since it had given over the room originally allocated to the School to allow an exhibition of paintings for local artists. However, the new rooms proved quite inadequate for the numbers of students and led to a slump in artisan numbers for evening classes. This was considered ‘bad publicity and bad for morale’ and, as a result, the School of Art regained its original premises from the Town Council in January, 1861. The results of the examination afford a strong testimony to the abilities of the Art Master, Mr John White, who has been efficiently seconded by the Art Pupil Teacher, Mr Farncombe. Indeed, White was given further praise in a letter of 8 February from Norman Macleod, Assistant Secretary of the Committee of the Council on Education at the Department of Science and Art in South Kensington. Perhaps the last major characteristic to be drawn from the Second Annual Report 1860 was the fact that an exhibition of almost 100 drawings and paintings, composed of works that had received medallions or an honourable mention in the National Competition, was displayed in the School of Art premises, attracting several hundred visitors during its run of some weeks. These annual shows became a regular feature of the Art School year, marking out a tradition that has evolved into the present day, often-flamboyant Degree Shows that take place annually in the College of Arts and Humanities & Architecture in Grand Parade at the end of the Summer Term. The present accommodation is entirely inadequate to the requirements of the Pupils now under instruction and applications for instruction have often to be refused. Your Committee are therefore glad to be able to congratulate the subscribers upon the prospect now offered of a suitable School Building being ere long erected. The final sentence of this quotation referred to the fact that, in September 1873, the Mayor and a number of leading citizens had formed a fund-raising committee to provide the School with a new building. Problems about locating an appropriate site came to the fore: one early ambition had been to situate the new School opposite the Public Library and Museum, but this proved problematic and attention then shifted to finding a site on the Stanford Estate. However, the School’s Management Committee felt that a central location was essential and eventually, in 1875, a site in Grand Parade was secured. This was seen to be not too far from the railway station, as well as being well-placed to attract its intended mixed constituency of independent fee-paying students through the proximity of private schools as well as housing of both the professional classes and working classes. In January 1875, a provisional contract for the erection of the new School of Art was approved and, in the following months, Alexander Fisher advised the Building Committee about the requirements for the building and the drawing up of instructions to architects. On 27 July, John L Gibbins’ design was selected from ten proposals that had been received following advertisement. By early January 1876 the plans for the complete building were passed,having been drawn up in line with the guidelines that the that the Department of Science and Art had issued in 1859. Gibbins, a local professional architect, was formally appointed, tenders for the building were put and won by a Mr Lockyer at a cost of £6,150, and the building erected through the generosity of a Captain Hill who lent £5000 at 4.5%. The importance of this loan should not be underestimated since the maximum that the Department of Art and Science in London would contribute to towards the project was £500, providing that qualified staff delivered the courses. It was perhaps fitting that on 9 June 1876 Henry Cole, the central figure in British art and design education between 1852 and 1873, should lay the foundation stone for the new Brighton School. As has been seen earlier in his design reforming Journal of Design, Cole was far more than an educational bureaucrat, having been a Royal Society of Arts design prize-winner of a teapot that was successfully put into mass production by Minton in the late 1840s and a moving force behind the Great Exhibition of All Nations held in the Crystal Palace in Hyde Park in 1851. At the 1876 foundation-laying ceremony Cole stated that he felt that, in terms of art education, Brighton had fallen behind other towns in the region with smaller populations, largely due to the fact that the existing premises occupied by the School of Art were not fit for purpose. In 1871 Brighton’s population stood at 103,000 but the School had only 173 students, whereas Croydon had 70,000 inhabitants and 200 students, and Southampton had 55,000 inhabitants and 260 students. The northern wing has a panel, with figures in alti relievi, symbolical of the Arts. Thus pottery is represented by a boy carrying an earthen vessel; Architecture, by another constructing a toy-house, Sculpture, by a sculptor at work on a bust; Geometry by a fourth figure examining a scroll; Building Construction, by a youth with a saw and a plank; Painting, by an artist at his easel, and so on…It says much for the artistic genius of Mr Alexander Fisher, the Head Master, who furnished designs for the decorations, that appropriate emblems have been given to each of the various figures. It will be a striking testimony to the value of the School if, in addition to the advantages it offers to existing trades and manufactures, it should prove the means of developing a new local industry which admits of the application of art in some of its highest forms. The raw material for this industry exists in the best quality in the neighbourhood of Brighton, at and near Ditchling, having excellent communications with the metropolis, which is the great market of wares of this description. The ground floor of the new School of Science and Art was devoted to Administration and Science, for which the School was well-equipped in terms of equipment and two rooms (including a tiered lecture room) for lectures in ‘Chemistry, Steam, Electricity Magnetism, Optics, Acoustics and other branches of Physics and Mathematics’. Alexander Fisher also contributed to this aspect of the curriculum with a series of lectures on mathematics. Prior to this period, the only science that had been taught in the School was closely related to art studies. The first floor was devoted to art and consisted of a number of rooms including the Elementary Room. This was top-lit, measured 38 feel by 32 feet, and was where pupils were seated at long desks on long benches, copying exemplars borrowed from the National Art Training School in South Kensington, thereby adhering to the tightly structured Course of Instruction laid down by the Department of Science and Art. The same room was used for classes in Building Construction (with blackboard demonstrations). The Painting Room, also lit from above, contained of many celebrated antique busts and classical sculptures and was used only by advanced student and ladies’ classes. 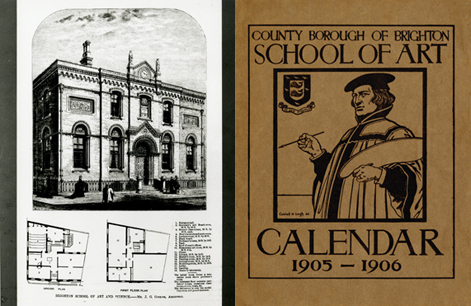 On 3 February 1877, the new School was opened amidst great municipal celebrations and rejoicing (BSA44). Princess Louise, the most artistic of Queen Victoria’s children, and a highly appropriate choice for such an event, played a leading role. Often entertaining leading contemporary artists at Kensington Palace, she was an accomplished sculptor in her own right. In 1872, She was also the co-founder and President of the Union of Higher Education of Women. Almost inevitably, another major presence at the opening ceremony was the Victorian art educational tsar, Sir Henry Cole. …must ever remain in the centre of trade, placed as we are in the ocean between many great countries. The course of trade should always sweep past us. Make the best use of Science and Art, and cultivate both in all manners of manufacture, as well as durability. You may say what occasion have we to fear, for no other nation can compete with us in such respects. But, believe me, you will find some very strong competitors among European nations. The linking of art and science highlighted in the Marquis of Lorne’s 1877 inauguration speech for the new School was also reflected more widely. In the later years of the century many felt that Britain’s lack of progress by comparison with her leading industrial competitors could be placed at the door of inadequate education in the scientific and educational fields. A number of Commissions were set up to address this and related issues, including the 1881-84 Samuelson Royal Commission on Technical Education. The fact that art education was becoming so dominated by the fine arts was also noted in the ensuing report of 1884; it also commented about the lack of first initiated under the Board of Trade in 1837. The Technical Instruction Act of 1889 allowed local authorities to form Technical Instruction Committees, to levy rates in order to raise the standard of art and science education for artisans and, as a consequence, ally themselves more closely to local industry through education. At this time the Brighton School of Science and Art was still under the control of its Board of Trustees and Advisory Committee and was dependent on student fee income, local subscriptions and the modest grant income from the Department of Science and Art. However, new funding opportunities emerged in 1893 when the residue grant was given over to the County and Borough Councils and the School’s Trustees and Committee passed the School over to the County Borough Council as a gift. 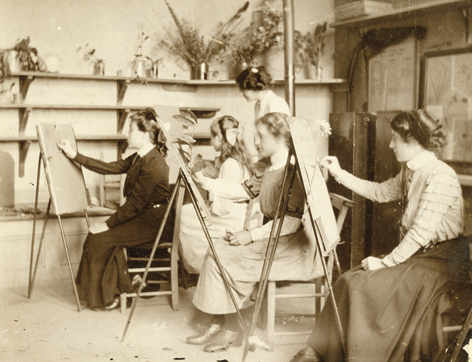 Image: Women teachers and pupil teachers' drawing class, early 1900s. Art School Archive in the University Design Archives. Apart from general excellence, three features are conspicuous – (1) the large e number of students who have passed through Brighton Training to take up responsible positions throughout the country and abroad; (2) the co-ordination of art instruction with the general life of the town; and (3) the close correlation of the instruction of the School of Art and other institutions under the authority. The Chairman of the Brighton Municipal Art sub-committee gave further evidence of Brighton’s position in the wider national context when he stated that, judging by the amount of grant received, the School of Art was eighth out of the 16 principal Art Schools outside London, and first, in terms of grant and student numbers, south of London. As has been described above, the early decades of the twentieth century were important for curriculum development alongside national and international debates about the wider role of design and economy, a significant undercurrent that had surfaced frequently since the 1830s. However, it was not merely the initiatives of Lethaby, Crane and Newbury that suggested new directions. In 1915, the Design and Industries and Industries Association (DIA) was established, a national non government-funded organisation that set out to establish stronger relationships between British designers and manufacturers. The DIA was never as radical or all embracing as its German counterpart, the Deutscher Werkbund (DWB), founded in 1907, that had inspired it. The DWB was an alliance between manufacturers, designers, educators, philosophers, politicians and others who recognised the economic significance of producing well-designed, high quality goods for export. A large-scale DWB exhibition was mounted in Cologne in 1914, where buildings by Walter Gropius (the future Director of the German Bauhaus) and others announced the advent of modernism and a distinct rupture with the historicising preoccupations of the Victorian era. Several leading British designers had visited the Cologne exhibition inspiring them to launch the DIA: Brighton School of Art was an early member of the DIA along with a handful of others – Bath, Bradford, Camberwell, Cork, Edinburgh, Huddersfield, Leicester, Ipswich, Nottingham and Woolwich. The Head Master at Brighton, William H Bond, played an important role in promoting the aims of the DIA in the town, explaining its purpose to the Brighton and Hove Chamber of Commerce that gave approval to its aims and objectives in a meeting held in October 1915. Bond explained how Britain lagged behind her competitors such as Germany and America, claiming that the typographer ‘Edward Johnston was far better known in Germany than he was in England five years ago’. In his address to the Chamber, Bond also emphasised how progressive British furniture design ‘known only to a few’ had inspired the work of the Germans, as had the British education system. Also reflecting issues raised earlier in this chapter, Bond drew attention to the gulf between technical and art education in Britain. …. war engrosses the whole mind of the nation…Supposing you had in your school Benevenuto Cellini or Raphael. They could not save the slaughter of a single soldier or advance one fighting line a single inch. … the students of the school in the highest terms for the way in which they have kept to their work amid the anxieties of war. Such a school at the time is a real asset to the town. People are telling us that we are descending into barbarism under the pressure of the war spirit. Such an organisation as the Brighton School of Art is preserving us from that fate. It refuses to allow the finer aspects of life to be destroyed by the war spirit. Also somewhat controversial was the position of Percy Horton, alumnus of the School of Art and later Master of Drawing at the Ruskin School of Art, Oxford (1949-64) who features on the individual pages of this book. Politicised from an early age (as was his brother Ronald), Percy had studied with distinction on a scholarship at the School between 1912 and 1916 and appeared in court in July 1916 charged with failing to report for military service. He argued to no avail that, as he was a genuine conscientious objector to war, conscription - which had been introduced in the same year - should not apply to him. He was, however, sentenced to two years hard labour. Nonetheless, with the strong support of the Head Art Master, William Bond, the School of Art provided opportunities for a number of disabled soldiers at the Brighton Pavilion Hospital, offering training for such occupations as letter cutting in wood and stone, mechanical draughtsmanship, die-cutting and other related subjects that required instruction in industrial art. Princess Louise, who had become a patron of the School of Art on the occasion of the inauguration of the new School building in 1877, was interested in this work and visited the Hospital. These disabled soldiers studied from between 15 to 28 hours per week. During the later stages of the First World War, Bond was concerned with the appearance of Brighton, reacting negatively to many aspects of the urban environment, a theme that a number of his British arts and crafts antecedents such as John Ruskin and William Morris had pursued with zeal. When addressing the Brighton Guild of Applied Art which, at a meeting in late March 1918, was discussing ideas about beautifying the town, Bond complained about the ‘gruesome horror’ of the New England Road railway arch and commented on plans to render it an ‘attractive entrance to the town’. Concern was also expressed that there should be much greater emphasis on cleanliness and tidiness in public spaces, particularly the railway station and its approaches. He also argued for the preservation of the ‘distinctive soul’ of Georgian Brighton and that the Town Council should desist from painting the Royal Pavilion ‘workhouse yellow’ as it represented the ‘last despairing cry of colour on its deathbed, and in its raucous tones some devilish influences might be traced’. Professor W R Lethaby of the Central School of Arts and Crafts, London, and a member of the DIA, served as one of the Vice-Presidents of the Brighton Guild of Applied Art. Image: Wartime weekly timetable, 1916. Art School Archive in the University Design Archives. The School of Art is probably unique among similar institutions of the country in that the Principal has complete control of the teaching in the various elementary and secondary schools of the town, ensuring co-relation between their work and subsequent studies at the “Art School”. Like Bond before him, Evans sought to forge links between the School and the wider context of the town and its industries. Eight foremen who were working in various workshops in the town were employed to provide instruction in architecture, wood and stone carving, metalwork, enamelling, gold and silversmithing, jewellery, typography, lithography, house painting and decorating and sign writing. Classes from the art teachers at the School supplemented such vocationally focussed classes. 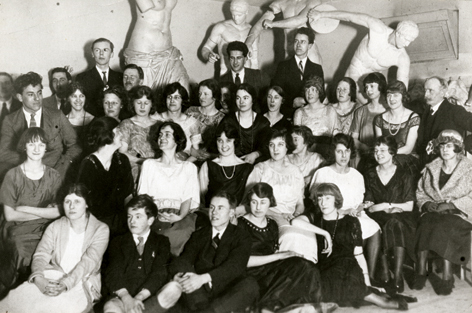 Image: Brighton staff and students in front of classical plaster casts for studying the human form. Art School Archive in the University Design Archives. W H Evans served as President of the National Society of Art Masters in 1924, a year in which its annual conference was held in Brighton School of Art. Key speakers were Harold Curwen of the Curwen Press and President-elect of the NSAM and Joseph Thorp of W H Smith, talking respectively on drawing for posters and printing and on art and the businessman. Both were keen members of the DIA and stressed the correlation between good design and good business, a cri de coeur that resounded through the decades via bodies such as the British Institute of Industrial Art, established in 1920, the Board of Trade’s Council for Art & Industry which began operating in 1934, and the Council for Industrial Design, formed in 1944 and, in a rather different way, in the emphasis placed on the creative and cultural industries in the decades on either side of the Millennium. In his 1924 Presidential Address, Evans suggested that, in terms of the relationship between art and industry, ‘the pendulum has swung too far in the direction of industrial art’. By this he meant that he believed that design education in particular was overly vocational and that there was a need for an educational system that acknowledged the importance of the liberal arts as a support for, and counterpart to, what were then termed the commercial arts (such as graphic design and advertising). This was an area of debate that continued in various ways throughout the interwar years, eventually coming to a head in the 1960s (See Chapters 4, 6 and 7). In the following year, 1925, the President of the Federation of British Industries, Colonel Vernon Willey, spoke at the National Society of Art Masters conference at Leeds School of Art and argued strongly about the need to bring together ‘artistic design’ with the ‘country’s industries’. Although acknowledging British traditions of quality and durability in mass-produced goods, he felt strongly that ‘one must recognise that both business and culture are becoming daily more and more international and, in spite of our conservative instincts, we, as a nation, must, I think, learn to comply rather more than we have done with international demands’. In fact, the work of Brighton School of Art performed well in the international arena, as evidenced by its showing at the 1925 Paris Exposition des Arts Décoratifs et Industriels Modernes, attended by more than 15 million visitors. Although the School had received its invitation to participate too late to prepare anything specifically for the exhibition (and thus for inclusion in the Exposition catalogue) the Daily Telegraph reported that it received a Diploma of Honour for technical instruction, a Gold Medal for technical instruction in ceramics, and Silver Medals for technical instruction in textiles and metal. More than 20 Schools of Art had been invited and Brighton gained far more awards than any other institution outside London, sweeping up 22% of those made to provincial art schools. Evans was clearly well thought of in the wider art school world as he was headlined in an article in Drawing & Design in 1925 entitled ‘Famous Contemporary Art Masters: William H Evans ARCA and the Brighton School of Art’. It was reported there that the School of 25 members of staff and 600 students was so successful that there were plans being drawn up for an extension, although it was ‘to be hoped that these extensions will not disturb Mr Evans’ beloved school garden, an old world flower and water garden with stone walks and pergola, formerly used as a rubbish dump, but now a valuable ground for the study of trees, flowers, birds and fishes, and a splendid background for models of all kinds, which are posed out there in fine weather’. Mural art was a field in which Brighton staff were widely recognised, bringing together the fine arts and interior design. A notable example of this was seen in the interiors of the Regent Cinema, Brighton, the first of the Provincial Cinematograph Theatres Ltd (PTC) ‘super cinemas’, seating 3000 and seen by the Times newspaper to ‘more nearly represent the American cinema theatre du luxe than any other building in this country’. Costing more than £400,000 and situated by the Clock Tower at the corner of Queen’s Road and London Road, its interiors included murals by Lawrence Preston of Brighton School of Art and Walter Bayes, Head of the Westminster School of Art. They worked closely with the Regent’s architect, Robert Atkinson, with Preston executing elaborate designs for the proscenium arch. Overall, the scheme was viewed as “possibly the most extensive and successful attempts to beautify a picture theatre undertaken so far in England’. Lawrence Preston’s other mural schemes included his First World War mural at St Luke’s School, Brighton, restored in 2007 after a £30,000 fund-raising campaign. Dorothy Sawyers, another member of staff at the School and described in 1925 as ‘perhaps the most brilliant decorative painter in the school’, was also widely known as a muralist who worked on cinema schemes. 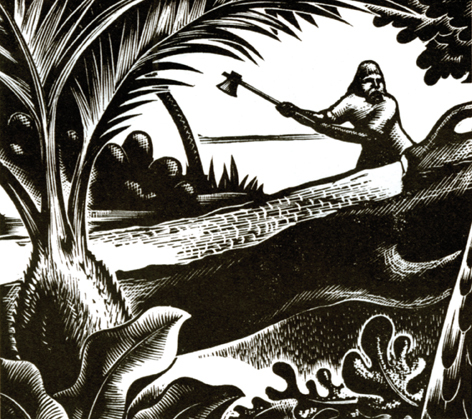 The scheme as unveiled in 1939 as The History of Man in Sussex and whilst superficially a sequence of well designed and realistic evocations of historical events which contribute to the making of Britain’s Empire, such as `After the Armada, it also contains a distinctive scientific interpretation of the past which takes to its logical conclusion William Hole’s earlier inclusion of Stone Age warriors in his ‘Great Scots’ frieze at the Scottish National Portrait Gallery, and reflects contemporary archaeological discoveries. There are many other instances of Brighton murals, many carried out by students in venues such as the Brighton Boys’ Club (late 1930s) and Brighton Girls; Club (1943). The latter involved a series of 8 feet square panels with examples of women’s heroism, such as Grace Darling and Elizabeth Fry. Executed by Naomi Thomson and Elizabeth Fry under the direction of the celebrated poster designer Frederick C Herrick, a member of School staff over several decades. These murals were unveiled by Derek McCulloch, Director of the BBC’s Children’s Hour, before an audience of 400 in March 1943. Other student work in the field included a later scheme in St Francis Hall, Moulsecoomb, by John Pelling, Brian Crouch and Derek Hall. Measuring 22 feet by 9 feet and completed in 1951, it depicted scenes from the life of St Francis of Assisi. This tradition of student involvement in the community has continued to the present day. During the 1920s there were growing concerns that Brighton was finding it increasingly difficult to attract a sufficient volume of tourist trade both at home and abroad, particularly in the face of competition from towns on the northern coast of France across the English Channel. However, inspiration was drawn from the south of France as one means of drawing attention to Brighton as an exciting place to visit. Nice had been the home of carnivals for centuries and provided the impetus for the Brighton version of the 1920s in which the School of Art tutors and students were highly enthusiastic participants in the design, building and manning of floats. Their work attracted the attention of the national press with preparations photographically reproduced in the Daily Graphic of 15 May, 1922, with finished products shown in photo-article spreads in the Daily Mirror and the Daily Sketch in early July, both of which featured the School of Art’s ‘Art through the Ages’ display. Praise for the School’s contributions in the following year were even more pronounced with an article in the Daily Mirror of 15 June, 1923, entitled ‘Art Students’ Contribution to Success of Today’s Carnival at Brighton’ in which it was also noted that ‘a lion’s share’ of the preparations for the Carnival were undertaken by them. In addition to floats there were 51 banners designed at the School of Art that were presented at the principal events. The organisers thanked both the Head Master William H Evans and the mural painter Lawrence Preston, an important member of the School staff. Sybil Thorndike was one of the Carnival judges. There were other positive ways in which members of the School of Art contributed ideas about the remodelling of Brighton in order to make it a more attractive tourist destination and place to live. Fine artist Charles Knight played a vital role in conjuring up exciting visual realisations for two schemes in particular, having gained his Art Teachers’ Diploma in 1923 and, in 1924, and holding, for a while, a full-time post at the School. The first scheme was the proposed redevelopment of Preston Park, a vista that would be visible to all visitors coming into the town on the London Road. The Council commissioned its Superintendent of Parks and Gardens, Captain Bertie MacLaren, to redesign this large open space as it had fallen into a state of decline. His proposals included a grand boulevard that would run from the Steine and encircle the park, the western half of which would feature a 6-acre lake, complete with five large sweeping terraces. Also planned was a rock garden with a waterfall to the lake that would be planted with reeds and populated by swans and water birds. Knight was commissioned by MacLaren to produce a watercolour that would breathe life into his vision, the resulting artwork being submitted to the International Exhibition of Garden Design of 1928. The second proposed scheme centred on the redevelopment of the Brighton Aquarium. Almost adjacent to the Palace Pier, its Victorian premises had fallen into serious decline in the early years of the 20th century and MacLaren again produced a dramatic design that would provide a fresh vision of a leisure space that would provide a much needed visitor attraction. The design included a glass-roofed concert hall with sliding glass doors that could be opened in the summer, a canopied walk where the orchestra could be heard whilst couples danced on a glazed, electrically under-lit floor. This setting was to be complemented by a rock garden that would occupy the surrounding slopes. Knight’s evocative visualisation of this plan was, like its Preston Park counterpart, shown at the International Exhibition of Garden Design of 1928. However, the proposal was not felt to complement neighbouring buildings, and was thought to be too costly and unsuitable for the site. Nonetheless, in the end, Brighton Corporation still committed itself to the modernisation by David Edwards, the Borough Engineer, of the Aquarium and its two terraces between 1927 and 1929. When re-opened The Times described the upper terrace as having ‘a bandstand from which orchestral concerts will be given and also a fully-licensed open-air café …set with small tables shaded by brightly coloured umbrellas of the type familiar outside the Café de Paris at Monte Carlo and other resorts where the sun shines’. In fact Brighton in the 1930s was alive with grand plans for modernisation, such as the transformation of Western Road into the ‘Oxford Street’ of the South Coast, the proposed development of Shoreham Airfield as a regional airport, following its purchase by Brighton, Hove and Worthing Councils in 1933, and the commissioning, in 1935. of the County Borough of Brighton Town Planning Central Areas and Development Plan. But nothing perhaps surpassed Sir Herbert Carden’s 1935 plans for the demolition of all seafront buildings on the King’s Road from Hove to Kemp Town (including sweeping Regency crescents and Sussex Square) and replacing them with twenty storey blocks of flats (JMW1) as outlined in his article on ‘The City Beautiful: A Vision of the New Brighton’. However, architects associated with Brighton School of Art worked in many styles: Kenneth Black worked in both the imperialising Mock Tudor vein, as in the King and Queen public house (JMW2) , and in the modern style, as in the new municipal market building, Circus Street. (JMW 3) John Denman, for many years attached to the School, designed many buildings in the modernising compromise between the vernacular and the modern in a 1930s muted neo-Georgian. The students of the last generation had no such artistic training…hence the intolerance of the antimacassar, aspidistra and the case of stuffed birds. The teaching [at the new International College] will result in a demand for better-designed goods which the producer will not be slow to meet and which will enable us to compete on much better terms with rivals who are sometimes more artistic. … would also undertake research work for industry, in the same way that a university did at the present time. The present day artist and designer was not afraid of machinery; in fact, he welcomed it but he realized that it must be controlled by those whose aesthetic tastes had been properly trained. It was envisaged that the School of Architecture would embrace architectural training alongside related departments of sculpture, painting and decorating, with courses in town planning, civic design, landscape garden planning, interior decoration and architectural model-making. It would also contain a Department with classes in carving, plastering, pottery and tile making. The School of Painting and Graphic Art was planned to include Departments of Drawing & Painting, and Book Production & Commercial Design, the former including mural painting, and the latter dealing with posters, book covers, advertisements, book illustration and decoration, with classes in etching, engraving, mezzotint, aquatint, lithography for art and print, and letterpress printing for compositors and machinists. The third School, devoted to Design, would comprise a Department of Industrial Design and a Department of Women’s Crafts. The former was intended to involve industrial design across a range of practices, alongside facilities for jewellery or enamelling, silversmithing, stained glass and mosaic, window and shop display. Women’s Crafts were seen to embrace embroidery, dress design, fashion drawing, French modelling, costume designing, leatherwork, and textile printing, weaving, dyeing and spinning. Sallis Benney also anticipated three further independent Departments: Extramural Studies, Teacher Training, and Theatrical and Cinematographic Art. It was the latter that was most radically innovative as students would be able to take classes in cinematography as well as set-design, scene painting, stage lighting, theatrical model making, property designing, and wig-making and make-up. Brighton was an appropriate location for such training as it had bee home to Britain’s pioneering film industry in the closing years of the nineteenth century and the early twentieth century. It was clear that none of these major ambitions would ever be realised without a new building that could accommodate all these new spheres of activity. Accordingly, in 1936, plans were put forward for a new Municipal School of Art, at an envisaged cost of £165, 430. On 24 September of the same year three large architectural schemes were considered by the Town Council: the new Town Hall, the Sea Front Improvement and the new College of Art. The first, John L Denman, designed by John L Denman who had run the Architecture Section at the School of Art during the 1920s and later served as the President of the South-Easter Society of Architects, was rejected, the second put forward for planning and the third, the envisaged College of Art, was approved, having been described in a report prepared by the Education Committee for the Town Council as being central to the region. It would provide ‘the most advanced work in fine art and industrial design and craftsmanship’, pay ‘special attention to the artistic needs of the staple industry or industries of the district’ and, in some cases, offer courses for intending teachers. Thirty men and women, many of them well known artists, forming the part-time staff of the Brighton School of Art, have been given notice following allegations that their appointments have influenced by favouritism. Great secrecy has been observed on the matter and last night many of the students were unaware of the decision. The notices expire at the end of the term. Those sacked included Walter Bayes, Louis Ginnett and Charles Knight. However less than two months later, Brighton Town Council passed a resolution regretting the decision of the Education Committee, requesting that it should rescind the notices given. This it eventually did in a meeting lasting seven hours and twenty-five minutes, its longest meeting on record. 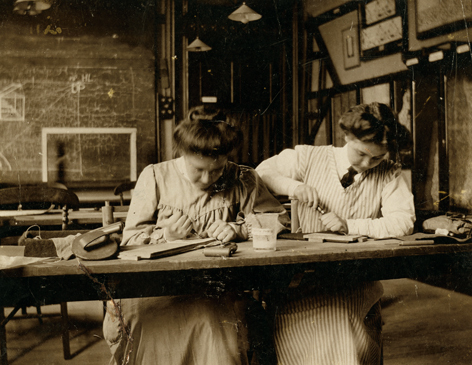 The School also sought to develop courses in new fields, establishing a Department of Women’s Crafts in 1936. Alice Umpleby was in charge of the department from 1938, having come to fashion design through her professional involvement with printed textiles and fabrics. She believed that a curriculum for shaping the ‘modern fashion expert’ would include the design of fabrics, dress design, fashion drawing, embroidery, the making of accessories, millinery, weaving and the study of the history of costume and theatrical costume. BSA20b She exhibited fabric designs at the 1937 Paris Exposition Internationale des Arts et Techniques dans la Vie Moderne, also showing two embroidered panels at the Arts & Crafts Exhibition at the Royal Academy of Art where Norah Braden and Miss Dean, who taught millinery at the School of Art, were also included. Other initiatives included window and shop display, a discipline that had featured in the plans for the new building in the form of a display hall in which it was envisaged that there would be bays in which experimentation and research in the field could be conducted and displayed. From 1936 Reginald White, display manager for Rosling’s the drapers in London Road, Brighton, ran classes on window display on two evenings a week. (Display & Co) In the same year he won the national Daily Express Window Dressing Contest. The course also fostered links between the School and local businesses, W C Dudeney, of the Eastern Brighton Traders Association, chairing a series of lectures exploring various dimensions of the subject. Late in 1937, Brighton window display students participated in a competition organised under the auspices of Women’s Wear News andjudged by A Edward Hammond, editor of Women’s Wear News, Sallis Benney and Frank R Metcalf, display manager of Hannington’s Limited. On the outbreak of War, students from the art section from Westminster Technical School College and the North London Polytechnic School of Architecture were evacuated from London and began classes at Brighton School of Art. At this early stage the School was also provided with various safeguards including the shuttering of its windows, the digging of trenches at the immediate rear of the building, and the provision of Air Raid Precaution (ARP) equipment for dealing with bombs and a first aid post. The School of Art was able to demonstrate its usefulness to the wider community through involvement with the propaganda campaigns, in which the Women’s Crafts Department provided a particular focus, especially in the ‘Make Do and Mend’ ethos following the introduction of clothes rationing in 1941. During 1942 and 1943 members of the Townswomen’s Guild of Brighton and Hove were keen to follow evening classes on toy, glove and slipper making; by 1944, demand for the Department’s expertise was significant, with class numbers rising to forty rather than the anticipated sixteen. Youth leaders, aged from 14 to 60, received instruction from Mabel Early, assisted by two of her day students, in pottery, embroidery and handbag making. Students were typically involved in activities such as designing a shop display for the Spitfire Fund in 1940 or the production of a 56 feet by 28 feet poster of Winston Churchill for War Weapons Week in 1941. Posters were also designed for the Ministry of Information and the Women’s Voluntary Service. Students also assisted in such tasks as mapmaking for the RAF BSA56 and the production of an illustrated map of Prisoner of War Camps for the Red Cross Society. 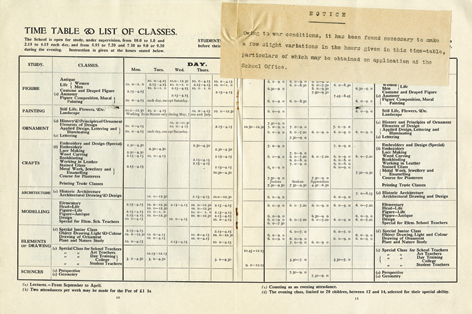 During the War years the School also provided classes for several thousand members of the armed forces in a range of disciplines. Brighton has become one of the most important art centres in the country. Students from all over the country, from South Africa and Holland and former underground workers in Norway, attend the already crowded College of Art. So many have chosen Brighton that for the first time there are long waiting lists for some courses, and only those studying for a full-time artistic career can become full-time students. The fact that there were about 300 full-time and 1200 part-time students with limited accommodation and pressures on access to equipment ensured that plans for a new building were high on the agenda. It should be remembered that during the War, as thoughts increasingly began to focus on reconstruction as the Allies began to get the upper hand, there were also aspirations to confirm Brighton as the educational hub of Sussex through the gaining of University College or even University status for the municipality. In a 1943 report to the Planning sub-committee of Brighton’s Education Committee it was proposed that the new Art School should be built closer to the Technical College and that ‘if all Brighton’s municipal buildings were grouped around The Level with that open space as a campus, Brighton might have a civic centre of which it could be proud’. Such a bringing together of such constituents presaged ideas about Polytechnics two decades later. It was also proposed in 1943 that a new Town Hall could be erected on the same site, adjacent to the new School of Art, showing how well thought of the latter was from a municipal perspective. Ten years later proposals emerged about the possible relocation of the Brighton College of Arts & Crafts to Falmer, although this was seen as problematic given problems of access for part-time students and part-time staff travelling down from London. Design was very much to the fore in the public arena in the latter half of the 1940s, the Board of Trade having created the Council of Industrial Design in 1944, an organisation whose first major public display of design in a post-War world was the Britain Can Make It (BCMI) Exhibition held in the V&A in 1946, attended by over 1,432,000 visitors. Many books and magazine articles were centred on themes such as ‘Reconstruction and the Home’ and ‘Homes for the People’, with a variety of department stores, the British Industries Fair and even the Daily Mail Ideal Home exhibitions following design propaganda lines. The new Brighton College of Art also played its role in such design propagandist activity. In 1947 it mounted its own ‘Design in the Home’ exhibition that included items of furniture, kitchen equipment and electrical appliances as well as a range of pottery, glass, silverware and other domestic artefacts. BSA56 BSA77 The organisation of the display, sponsored by the local Head Teachers’ Association and intended to capture the interest of older elementary and secondary school children, was the task of the Teachers’ Training Department under Ronald Horton, its Head since his appointment in 1944. In the spirit of BCMI, the Brighton ‘Design in the Home’ exhibition included contrasting examples of ‘good’ and ‘bad’ design, an idea that had a long pedigree in design reform circles such as the DIA in Britain or the Deutscher Werkbund in Germany in the 20th century or, chronologically more distant, the ‘Chamber of Horrors’ at Marlborough House (an ancestor of the V&A) in 1852 which sought to warn consumers of ‘False Principles in Decoration’ in the wake of the Great Exhibition of 1851. At the Brighton exhibition of 1947, teacher training staff and postgraduate students introduced the schoolchildren visitors to the exhibits, encouraging them to comment on, and discuss, the exhibits. The correspondent of the Times Educational Supplement of 6 December 1947 felt that the comments passed were lively, intelligent and perceptive. Over 2000 visitors attended the exhibition, held in Circus Street, and smaller satellite exhibitions were circulated around local schools accompanied by an educational pamphlet. Brighton College of Art and Industrial and Commercial Education. As had been stated by the Victorian educationist Henry Cole in the 1860s, Brighton College of Art did not have specific industrial links in the way that was the case with similar educational organisations in Manchester and Birmingham. Nonetheless, in the 1950s it was well placed to provide expertise in commercial and industrial design and worked with industry through a number of Advisory Committees alongside local, regional and national arts associations. Such activities found their applications in the development of the curriculum. For example, in 1951, the first cohort of students completed the National Retail Association of Furniture Retailers Diploma, launched at the College in 1949 as the first such course outside London. Students on the course were drawn from local businesses, such as George Hilton & Sons of Haywards Heath, Johnson Brothers of Brighton and Rings Ltd of Hove. At the first Awards Ceremony, J Ramage, Director of the Association of Retail Chambers of Trade, noted that it was ‘right that Brighton – one of the loveliest centres of retail distribution in this country – should have taken the initiative’. It was an initiative that was soon followed by Manchester, Nottingham and other centres of art and design education and reflected the preoccupations of national bodies such as the Council of Industrial Design that were also offering educational courses to furniture retailers and buyers. The College established other links with furniture retailing in Brighton as seen for example, in John Bowles’ Duke Street retail outlet where students showed their textile designs. 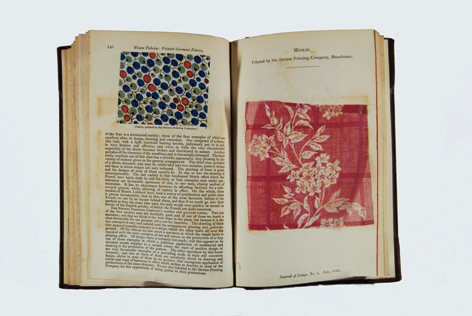 That there was a high level of technical understanding in student work was confirmed in a speech by Sir Ernest Goodale, a leading textile industrialist who had served on the Council of Industrial Design, a major figure in the formation of the Federation of British Furnishing Textile Manufacturers, and President of the Silk and Rayon Users’ Association, at the Annual College of Art Exhibition at Brighton Museum and Art Gallery in 1953. In these years the School also worked closely with the Typographical Association to develop a strong printing department and workshops were set up in Circus Street and Sallis Benney asked for the support of Brighton and District Master Printers Association to help in the provision of machinery. This was secured through a government grant of £11,700 and was approved by Brighton Council although, inevitably, it was a matter of some debate before the last machine was installed in 1955. In 1940 there were 57 apprentices attending the School. Ten years later, there were 228, of which 150 were apprentices from local industry. The department was run by E J Gee from 1948 to 1953 when he was succeed by J A P Evans who retired in the 1970s. Brighton students also continued to be successful in the national context of RSA industrial art bursaries, the gaining of Rome Scholarships, places at the Royal College of Art and the Royal Academy Schools and other prestigious, though less well-known, competitions. These included the Evening Standard Fashion competition which was won in 1955 with a drawing of an Italian-inspired beach outfit by second year student Barbara Hulanicki who later went on to co-found (with her husband Stephen Fitz-Simon) the celebrated Biba fashion and lifestyle company. Featured in the Evening Standard in March 1953 in a drawing style that was swiftly to lead to many commissions in fashion magazines, her design was made up by Norman Hartnell, the Queen’s couturier. Two years later, Susan Rose won first prize in the Daily Telegraph International Wool Secretariat’s National Fashion Competition. However, the nature of the College of Art’s academic health was far from vocational in any narrow sense of the word, being concerned to embrace a wider social and cultural approach. As was remarked in an article in The Schoolmaster in 1954, the College sought to offer a sound and practical training to those wishing to become professional artists and craftsmen, to give fuller opportunities to apprentices or industrial workers to study the craft underlying their work and train intending teachers. But the college conceives its job in more comprehensive terms than that of merely teaching young people a particular art or craft. The aim is to “educate” them in the widest sense, to provide for their all round development with a view into making them into intelligent and broad minded, as well as technically excellent, workers. Those who listened to Ronald teaching, who watched him at work in a class, saw him at his easel, talked with him of social or historical matters, soon found what a wealth of knowledge, of wide reference, informed both the teaching and the painting. Beginning thus early, educating himself thus deeply, he amassed a most remarkable library whose special characteristics was its range of illustrated books and prints recording the social life and history of the common people from whom he came: very specially, its children’s books, dating from before the Revolution and coming right into the present, has now augmented the treasures of our National Art Library in the Victoria & Albert Museum; an unrivalled collection of children’s games, puzzles educational toys and toy theatres, has gone to the College of Librarianship of the University of Wales , Aberystwyth. From all of these intimately known, endlessly researched and lovingly ordered resources, students of the ATC course here, year by year from 1946 [sic] to 1966, were sumptuously fed. In addition to the Art Teacher’s’ Certificate, the Art Teacher Training Department offered a wide range of other opportunities, including refresher courses for teachers from Brighton and the surrounding region. There was also considerable direct contact with schools in the area as for many decades Brighton College of Art had been responsible for the control and development of art education in municipal primary and secondary schools. Ties had been further consolidated through the awarding of municipal scholarships for children to attend the College of Art or, before that, the School of Art. In the post War period Ronald Horton took on the role of the Schools’ Art Superintendent. The broad-based educational rationale at Brighton, to which The Schoolmaster had referred in 1954, took on a particularly liberal edge in the Art Teacher Training Department. Students participated in a wide range of activities including oral history, theatre productions, music and written studies, all of which were acknowledged as part of the curriculum. In fact, the ATC students were much more geographically diverse than the student population of other departments in the College. They came from all over the world, their countries including Africa, Ceylon, China, Cyprus, India, Pakistan, and the West Indies, and significantly enriched the collective and individual experiences of the student body as a whole. The period between Sallis Benney’s retirement as Principal of the College of Art in 1958 and the formation of Brighton Polytechnic in 1970 proved to be a testing time for art and design education at Brighton on a number of fronts. These may be summarised by three distinct themes: firstly, the managing and implementation of a large-scale building programme at Grand Parade; secondly, the fierce debates about the nature and content of art and design education set off by the Coldstream and Summerson Committees’ advocacy of a new Diploma of Art and Design (DipAD) to replace the National Diploma in Design (NDD); and thirdly, the art and design community’s perceived difficulties in adjusting to such changes alongside those of becoming a constituent part of a new type of higher education institution – the Polytechnic. Although certain aspects of all of these concerns are dealt with elsewhere (Chapters 4,5, 6 and 7), it seems appropriate to outline here some consideration of the difficulties facing the new Principal, Raymond Cowern, and his staff and students in the years between his appointment in 1958 and his retirement in 1974. Arguments for a new building had gathered pace in the 1930s with Sallis Benney’s ambitions for establishing an International College of Arts & Crafts in Brighton although, with the very pressing realities of cramped conditions and growing student numbers, they became increasingly compelling in the 1950s. In 1958 the decision was taken to erect the new building on the Grand Parade site although, due to the many deliberations about its ‘fit’ with the environment, the commencement of rebuilding was delayed until 1961-62. Decisively modern and pseudo anything, the building nonetheless makes gradual easy transition from the Regency bow-fronts adjacent in Grand Parade to the sharper, cleaner, more functional lines of 1958. Even so, it was decided to take further advice and Sir Hugh Casson was brought in as an advisor with resultant changes in the façade and roof line and the production of a modern building appropriate for the needs of art and design education in a changing contemporary world. As is discussed in Chapter 4, Phase 1 of the Project, the Wing along William Street, was completed in late 1969 and housed all of the vocational about here and craft courses. Phase II, which was the most complex as it involved the demolition of the century old Brighton School of Art and the decommissioned Roman Catholic Apostolic church which had housed art teacher training and hairdressing, was completed in 1967. Housing Fine Art, the Library, the Refectory and the Hall, it was formally opened by the President of the Royal Academy, Sir Thomas Monnington in June. Phase III, housing the Gallery, Graphic Design Studios, Printmaking, Photography, and offices for the Directorate and the Administration, was completed in 1969. However, as indicated above, the site that these three phases occupied was considerably smaller than that first envisaged. As a result, not all buildings could be housed in new premises: Fashion and Textiles were in a former school in Finsbury Road, Architecture and Design in Circus Street and St. John’s, Three Dimensional Design in Circus Street, Complementary Studies in Glenside, Art Education Studies in Sussex Square, and the Art Centre in Bear Road, and there were no student halls of residence. Substantive changes in the nature of art and design education were unfolded during the 1960s and early 1970s, most significantly due to the consequences of the findings of the National Advisory Council on Art Education established under Sir William Coldstream in 1959 and the National Council for Art and Design set up under Sir John Summerson to administer the new schemes for the new Diplomas in Art and Design (DipAD) in 1961. Under this new framework students would take a one-year pre-Diploma course (subsequently widely known as Foundation Courses) followed by a three-year specialist course in one of four areas: Fine Art, Three Dimensional Design, Graphic Design and Fashion/Textiles. These new diplomas were conceived as degree equivalent courses with 15% of the curriculum devoted to Art History and Complementary Studies as a means of enhancing the vocational with an intellectual enhancement. The tension that this caused in many Colleges led to the student unrest of 1968, the Brighton dimensions of which are discussed in detail in Chapters 6 and 7. A number of Brighton students were quite politicised, with Ronald Horton, John R Biggs and Ray Watkinson supporters of the Communist Party. Indeed, the latter, a staunch Communist Party member throughout his adult life, used to take students to the Communist Art School in London in the 1960s and was a participant in the Brighton and Hornsey occupations of 1968. It should be made clear that other colleges which can promise an improvement in their standards and equipment will be recognised promptly, that local enterprise, even though tardy, will be recorded and that colleges already recognised for DipAD in one or two courses only will be encouraged to broaden their field at Diploma level. Students now campaigning against Sir John Summerson and his colleagues should turn at least part of their energy to stimulating the education authorities in their areas to improve their college to Diploma standard. Brighton received approval for a DipAD in Three Dimensional Design, with Interior Design as the main study area, in 1965. At the time there were only four other institutions recognised to run such courses. In the same year a Certificate of Industrial Ceramics was launched at Brighton, a high-level vocational course promoted by the pottery industries and offered by a number of Schools of Art in collaboration with Stoke-on-Trent College of Art. However, throughout the rest of the 1960s and even after the College of Art became a constituent part of Brighton Polytechnic in 1970, the academic implications of the Coldstream and Summerson committees and reports proved problematic in various aspects of the relevance of the provision of art history and complementary studies in Brighton, discussed in depth elsewhere in this book. In 1963 the Robbins Report on Higher Education was published, followed three years later by the publication of the White Paper, A Plan for Polytechnics. The latter had particular implications for Brighton College of Arts and Crafts as it was singled out as one of the constituent parts of a proposed Brighton Polytechnic, along with Brighton College of Technology. Raymond Cowern, the Principal, was strongly opposed to any such change in status and standing, along with Brighton’s Education Committee. Of course, Cowern was not alone in his opposition in the art and design education world. A meeting of the 40 Principals of Art Schools was convened in November 1966 to consider the implications of the White Paper for art and design, with only four Principals supportive of its ambitions. There were five major objections: firstly, that the proposed scope and size of the new institutions was not necessarily appropriate for the needs of art and design education; secondly, that the envisaged complexity of their organisation would threaten recently gained autonomy in terms of staffing and course development and would constrain the impetus that had been generated since the start of DipADs in 1963; thirdly, the polytechnics were organised on a regional basis rather than being institutions already concerned with national standards; fourthly, polytechnics were seen as low level amalgamations of colleges of commerce and technology, and therefore inappropriate partners for institutions that were already running degree-equivalent courses; and fifthly, and possibly most significantly, polytechnics were an unknown quantity. There were a number of Art Colleges – Brighton, Bristol, Hornsey and Kingston – that opposed ministerial drives to merge them with local Colleges of Technology. Brighton’s Education Committee stance took the view that the Brighton College of Art should be preserved as a specialist institution of art and design. However, in 1968 the Brighton Education Committee received a letter from the Department of Education and Science (DES) in which it was stated that the Secretary of State believed that, although it was accepted that there might be particular arguments whereby a College of Art might be maintained separately from a neighbouring Polytechnic, he did not consider this to be the case in Brighton. This made for a particularly fraught political climate in Brighton, with the College of Art resolutely opposed to its participation in a Polytechnic structure whilst the College of Technology was worried that it ran the risk of losing its best students if Polytechnic status was not achieved. Nonetheless, a more positive position was emerging in certain quarters of the College of Art itself, with a pro-merger movement led by John Biggs, Head of the Department of Graphic Design, and Dr John Lomax, Head of the Department of Architecture. However, any such shifts in the balance of the argument were rendered meaningless by the DES announcement on 1 August, 1969, that Brighton Polytechnic would be formed through the amalgamation of Brighton’s Colleges of Art and Technology and that this would take place on 1 April, 1970 when the new institution would be formally designated. [The artist] is not someone who knows the answers. He is not a sort of visual quack. He is not a man who has found a spiritual haven and therefore automatically qualifies for a one-way ticket to Mecca. Rather, he is a man who realises that the whole point of “being” is fraught with the unknown, that he is driven in his own way (artists, you see, have this habit of asking questions, not announcing answers); he is driven in his own way to write words, make marks or gestures or sounds. If, as you have heard in the talk last week [by Gwyther Irwin on ‘Fine Art’], the artist asks questions but doesn’t answer them, the DESIGNER does not usually ask the questions – he provides answers to them. He is a problem-solver. However despite the uneasy accommodation of different standpoints at Brighton, the wider national campaigns against the absorption of art colleges into polytechnics continued into the 1970s, an outlook typified by Patrick Heron’s celebrated article in the Guardian in October 1971, entitled ‘Murder in the Art Schools’. This rallying call to the autonomy of the fine arts was given greater substance by the mass resignation, in the same month, of 19 of the 24 members of the Fine Art Panel of the NCDAD. It was perhaps a little ironic that this resignation hastened almost exactly what its participants were hoping to prevent – the amalgamation of the NCDAD and the Council for National Academic Awards, negotiations for which commenced in February 1972 as it was felt that it would benefit cross-disciplinary thinking and offer students the unambiguous status of degrees rather than degree-equivalent diplomas. Stewart Mason, Chairman of the NCDAD wrote to Geoffrey Hall, Director of Brighton Polytechnic, on 30 December 1971, to explain the position. He reported that the mass resignation ‘came as a surprise to the Council’ and that he saw it in part as ‘a protest against the Council for not in some miraculous way overriding the articles of government of polytechnics to give the art and design constituent within them some privileged position’. Meson went on to say that ‘the fear has already been express in the letters [of artists to the press] that the links with professional artists are being weakened in certain polytechnics as a result of the tendency to reduce the proportion of part-time teacher – and as a result the quality of work will deteriorate’. Raymond Cowern, who had become an Associate Director of the new Polytechnic, had become more accommodating of the idea of the Polytechnic and both he and Geoffrey Hall, the Polytechnic’s inaugural Director, were concerned that the new Faculty of Art and Design (as the College of Art had become) should not be an isolated element in the new institution. Both felt that Patrick Heron’s widely disseminated view about the independence of the art schools had overlooked the significance of design. The wider debates in the Faculty reflected the differences that existed in art and design education. Gwyther Irwin, the recently appointed Head of Fine Art, was concerned with the threats to the autonomy of fine art education as he did not see that it could justify itself in the quantifiable manner of other subjects and disciplines geared to specific social or economic goals. On the other hand, John R Biggs, Head of Graphic Design remarked that ‘Design was treated as a Cinderella in art colleges, and there was great resentment over the ways that fine art departments dominated art schools’, a view that he had espoused since his appointment as Head of Department in 1959. It was against this background that Robin Plummer, a practising fine artist and educator, was to take up post as Dean in 1974. From its earliest days Brighton School of Art (and successors) has always been involved with the town and regional community, whether in such areas as the annual displays of student work or close relationship with many of the trades in the town. On a wider cultural front staff and students’ participation in public performances began in the 1860s and constantly punctuated its history, whether the Carnivals and ‘Vision of Empire’ for Empire Week in the 1920s, innovative performance and ‘live art’ at the Zap Club in the 1980s, or a wide variety of more recent manifestations such as ‘Dance for Camera’ and ‘Smudged’ at Tate Modern led by Alice Fox. Important in this continuum was the College’s involvement with the Brighton International Festival from its inception in 1967, an event that marked the beginning of a much more radical engagement with wider regional, national and international currents. Such an outlook was to grow steadily over the next thirty years under the Deans Robin Plummer, Bruce Brown and Anne Boddington, as is clear from other contributions to this book. The College’s multimedia contribution to the 1967 Polytechnic Fringe performance of Hogarth’s England Hogarth’s England by John Boulton Smith and Rod Harman, bringing together film, mime, music and slides, made an impressive debut. Frances Walker, who also played a key role in overall direction, directed the College of Art Mime Group; John Vernon Lord edited the music, which included work by John Gay, Kurt Weill, Handel and Boyce; Ian Beck, an illustration student, played an 18th century gentleman, Hywel James took on the role of presenter and Robert Bentley had responsibility for film. It was all the more a pity that this splendidly blended symposium of film, mime, live commentary, song and slides could not have enjoyed a longer time. Devised by John Boulton and Rod Harman it is just the thing to fizz a bit of rumbustious life back into the festival which has got the midweek sags about now. But sadly we have to be content with a one night stand. A pity. There were so many facets to endear it to a discerning public or least its utter lack of pretension. Yet what marvellous flashes of real insight and talent went in to its make-up. In this inaugural Festival year, the College of Art also hosted three major conferences in music, drama and the visual arts, each lasting two days and held in the Hall (now Sallis Benney Theatre) in what was then the new building. The Music conference was chaired by Sir Edward Boyle with vice-chair Alexander Goehr, the Drama conference by John Clements with vice-chair J W Lambert, and the Visual Arts conference by Sir Roland Penrose with vice-chair Edward Lucie Smith. The College of Art also sponsored a Drawing Symposium where a panel of draughtsmen and critics answered questions on the future of draughtsmanship, accompanied with an exhibition of British Drawing Today organised by Edward Lucie Smith on behalf of the ICA and shown at the Brighton Museum and Art Gallery. The students played a role in the Festival of the following year, making a continuous doodle that ran from the Palace Pier to the West Pier. For the Festival the College of Art also hosted a Hoffnung Retrospective exhibition, arranged by Anetta Hoffnung, and a conference on ‘The Future of Film Making in the Cinema and Television’ to complement an exhibition arranged by the British Film Institute on ‘Pioneers of the Cinema in Brighton and Hove’. Such events marked a long-standing involvement with the Festival and which spread across many disciplines. In 1969, for example, the College of Art Fashion Show ‘Brighton Belle’ was put on at the Festival, having been held three times in the academic year 1968-69, the first time in December 1968 when it featured for 12 minutes on the ITV Today programme. It was performed as part of the Brighton Festival in early May, 1969, with tickets at 7/6d, eliciting a letter from Ronald Bates, Chairman of the Brighton Festival Society to Mary Bryan, the Head of Department, about the ‘excellence’ of the show. However, of particular significance in the Festival context was the establishment of the Theatre Workshop, run from the College and directed by Frances Walker. It made many contributions to Festivals from 1967 onwards, including ‘The Amazing Harold Show’ (1968), Camus’ ‘Caligula’ (1970) and Voltaire’s ‘Candide’ (1971). In the latter year the Brighton Polytechnic Theatre Workshop started as a Company and performed publicly from 1972 to 1978 when it was disbanded following the inauguration of the Faculty’s new Expressive Arts degree in 1977. During its life the Theatre Workshop brought together students from across all the departments to collaborate on set design, costume design and acting. The ultimate irony and indignity is that while the trend among progressive educationists towards flexibility, the very sector of further education which has been least hamstrung by medieval tradition is surrendering its relative freedom in return for a BA degree, the club badge and the rule book of a materialist society…There are already signs that some art departments are pathetically moving towards imitation of the academic conventions of the universities, having failed to understand the difference between the artist and the scholar. As the Polytechnic began to bed down in its early years and the Faculty adjusted itself to accommodate new academic bedfellows, Robin Plummer was appointed Dean of the Faculty of Art and Design and Assistant Director of the Polytechnic in 1974. A personal overview of this period by Robin Plummer himself is included in this book and gives a clear, but succinct, personal account of the contribution he made. Not least among his innovations were the transparency of course documentation, the introduction of clear criteria and systems for examination, systems of accountability and greater precision in job specifications. Andy Durr, who had originally been appointed to the institution as a technician, helped Plummer in such tasks and was, in effect the first Faculty Officer. Valerie Kippax, the first formally appointed Faculty Officer, succeeded him in late 1976. A fresh diet of courses and innovations were rolled out during Plummer’s tenure of the post over the next fourteen years, despite the intrusive oscillations of the prevailing social, economic and political climate of the times. During this period the range of courses included Fashion & Textiles with Administration (validated in 1977), Graphic Design and Illustration, artist-craftsmanship as applied to Wood, Metal, Ceramics and Plastics (validated in 1974), the Fine Arts, Expressive Arts (including music, dance, performance, theatre and visual studies, validated in 1977), History of Design (validated 1980) and Adult Education, with the development of a number of postgraduate courses including the CNAA Postgraduate Diploma in Printmaking (validated in 1981) and Masters courses in Printmaking (validated in 1986) and Narrative and Sequential Illustration (validated in 1987). A new Department of Art History was formed and headed by Robert Haynes in 1977. David Vaughan was appointed as course leader for the BA (Hons) Wood, Metal, Ceramics and Plastics degree in 1979, later becoming head of the department of Three Dimensional Design. Another key appointment made in these years was that of Bill Beech who was appointed as the head of the department of Fine Art following the retirement of Gwyther Irwin in 1984. In September 1986 the Department of Humanities joined the Faculty thereby setting in place the opportunity to develop fresh curricular initiatives. During this period, the comparative long-standing of the DipAD courses in Fine Art and Graphic Design, having commenced in 1963, helped to secure a high national profile in these fields. Of course, Brighton’s reputation in these disciplines (most particularly fine art painting) continued to bring in tutors of a national standing as well as a range of part-time and visiting lecturer staff who, between them, formed a notable ‘Who’s Who’ of the disciplines as they have unfolded over the past forty years. The DipAD in Three Dimensional Design also gathered strength since its recognition in 1965, similar developments applying to the later validations indicated above. Robin Plummer was quick to see the importance of research for art and design, arguing for it nationally and implementing it locally. He was instrumental in setting in place a series of research assistants, including Evelyn Goldsmith in the Department of Visual Communication, and Penny Sparke, Suzette Worden, Jude Freeman, Hazel Clark and others working on design history in the Department of Art History. Such investment in design history culminated in the launch of the BA (Honours) in the History of Design in 1980, but was also partially instrumental in the launch of the now international Design History Society at the Brighton Design History: Fad or Function? Conference in 1977. Evelyn Goldsmith’s PhD, completed in 1978, led to her book entitled Research into illustration: an approach and a review, published by Cambridge University Press in 1984. Conferences were, and continue to be, important vehicles for setting agendas and at the time included the Research in Illustration Conference (1981) organised by Evelyn Goldsmith, having by then become Research Fellow in the Department of Visual Communication. The speakers included Quentin Blake, Head of Department of Illustration at the RCA and Ken Garland, consultant designer, with John Vernon Lord, Head of the Department of Visual Communication, as conference chair. Five years later - with Tony Cobb having taken over as head of school from John Lord in 1981 and himself been replaced by Bruce Brown in 1984 - the Electronic Design in the Graphic Arts Conference, was hosted with Brown as conference chair. The merging of the Polytechnic with the Brighton College of Education in 1976 resulted in the transfer of the Department of Art Education to the Polytechnic’s newly created Faculty of Education, long a distinctive aspect of the School of Art in its rite of passage from School of Art to Faculty of Art & Design. However, a number of academics specialising in the visual and performing arts joined the Faculty of Art and Design. This in turn led to the formation of a new Department of Combined Arts (including art, music, dance, drama, fashion and textiles and adult education) under the leadership of Peter Rose. Despite some misgivings on the part of a number of practitioners in the more established disciplinary fields in the Faculty, this proved to be a dynamic, challenging and highly productive initiative, with then young lecturers Liz Aggiss, choreographer, and Billy Cowie, musician, playing key roles. There was undoubtedly ‘something in the air’ in the later 1970s. As discussed in Chapter 5, the Art College Basement Club was an important catalyst in the development of live and performing arts at Brighton. It hosted a wide range of performances, such as those associated with the innovative Brighton Contemporary Festival Arts (1977-79) organised by Roger Ely (one of the last art teacher training students in the Faculty of Art and Design before the move of Art Education to the Faculty of Education) and Neil Butler, who had been President of the Brighton Polytechnic Students Union. Dave Reeves, with Butler, was one of the founding directors of the Zap Club, and had been an occasional doorman at The Basement. Just as Reeves was later to describe the Zap Club as ‘a space where new ideas in music, poetry, performance art, whatever, can be expressed’, so The Basement provided a bridge between performers from the Expressive Arts degree and the fresh opportunities offered by Zap. Amongst the many artistes associated with both Zap and the Faculty of Art and Design were comedian, comedy script writer and author of the best-selling The Confessions of Georgia Nicolson, Louise Rennison, dancer and choreographer Liz Aggis, performer and choreographer Anna Seagrave, Zap MC, performer and co-founder of Mischief La-Bas, Ian Smith, poet-performer Roger Ely, and comedian, writer and radio broadcaster Graham Duff. The latter was one of five Brighton students who comprised The Theatre of the Bleeding Obelisk, others made up the cabaret performance group Women with Beards, whilst Liz Aggiss and Ian Smith were members of the Wild Wigglers and Billie Cowie led the band Birds with Ears. This ‘hothouse’ of innovative performance did much to cement the reputation of Brighton as a centre of artistic activity and a place to study and perform. During the later 1980s the Polytechnic planned its way towards re-designation as a University in 1992, having received corporate status and independence from East Sussex County Council in 1989. In the same year, Professor Bruce Brown (see also Chapter 9) was appointed as Dean of the Faculty of Art, Design and Humanities and, following the retirement of the long-standing Geoffrey Hall, David Watson arrived as Director of Brighton Polytechnic in 1991. However, under John Major’s Conservative government the years immediately preceding the change to University status proved somewhat tricky to navigate in the economically choppy waters of the time. As had been the case at previous times of crisis, as in the late 1930s with the sacking by the Brighton Education of part-time staff from the School of Art, there were widespread worries in the early 1990s about the job security of part-time staff, a high number of whom worked in the art and design sector. In many ways the sector’s staffing profile, which included a significant number practising artists, performers and designers with their feet straddling both the professional world and that of the academy, was what had given the sector its ‘street credibility’ over many decades. Such anxieties about future staffing policies at Brighton were signalled in the one-day strike in November 1990 during ‘National Polytechnics Week’. Matters came to a head in the following May when concerns were once again aired about proposed reductions in hourly-paid and part-time staff alongside an anticipated non-renewal of one-year contracts of some associate full-time staff. If we are the ‘consumers’ of the ‘company’, in lieu of contract, ombudsman or official Customer Complaints Dept. [sic], we have no choice but to take this action. The Polytechnic issued a press release about the ensuing weekend occupation that began on Friday 10 May. There were reports that the ‘occupation has been orderly’ and Professor David Watson, the Director, acknowledged the ‘special features of work in Art and Design, the quality of which is widely recognized’. He also commented that ‘this area has been significantly protected.’ After a week or so the Faculty sites returned to everyday business, although the action and its perceived root causes attracted the attention of the national press under banner headlines that warned of the alternative either of heavy deficits in the institution or the loss of one in three jobs. David Watson wrote to The Times to counter the misleading nature of such reports as that of the paper’s higher education correspondent, John O’Leary. Seeing in the new Academic Year in September 1991 and the lead-in to University recognition, the Faculty implemented a new academic and management structure, all previous departments of the Faculty being reorganised into three major Schools: the School of Art under Bill Beech, the School of Design headed by Roy Peach, with Peter Widdowson appointed to lead the new School of Historical & Critical Studies. John Crook was the head of Continuing Education, which included responsibility for the Sallis Benney Theatre, and Robert Haynes, former head of the Department of Art & Design History, took on responsibilities for the strategic planning of the successful submission to the HEFC Research Selectivity Exercise in 1992 and the development of the Faculty Mobility Scheme. As indicated earlier, the Gallery has been an important cultural shop window for what the College of Arts and Humanities (and its predecessors) represents, both in terms of its ideology and its staff as practitioners and curators. Opened in 1969 as Phase III of the 1960s rebuilding programme, and further extended in 1998, it has hosted many distinctive and important shows. In the early days these included such exhibitions as ‘Children’s Art’ (1970) to celebrate the passing of the 1870 Education Act, ‘Komische Oper’ (1971), opened by Dame Flora Robson, and ‘Nineteenth and Twentieth Century Children’s Toys’ (1973). There has been a rich diet of exhibitions that have spanned the four decades of the Deanships (1974 to the present day) of Robin Plummer, Bruce Brown and Anne Boddington. They have been organized through different mechanisms, including the Exhibition Unit at Grand Parade ‘run by that eager beaver’ Julian Freeman. The latter, who arrived at the Polytechnic in 1978, curated an extensive programme of shows, ranging from Brighton Festival shows, such as ‘The Art of Frank Brangwyn’ (1980), to others devoted to the work of Brighton and Sussex-based artists such as Charles Knight (1979), Dorothy Coke (1981) and Ronald Horton (1982), all of whom taught at Brighton School of Art. Freeman’s last intervention before taking up a new post at the Barbican Art Centre in 1988 involved his co-selection with Professor Michael Tucker of the first British touring exhibition of Icelandic art (1988-90). In the 1990s Bruce Brown’s Dean’s Advisory Group, chaired by Michael Tucker, oversaw many significant exhibitions. Tucker’s prolific curations included shows such as 'Alan Davie: The Quest for the Miraculous - Paintings, Gouaches & Drawings 1959-1993', with a catalogue produced in collaboration with the Barbican Art Centre, London (1993-4), and 'Ian McKeever: Works on Paper 1981-1996' (1996). In 2000 Barry Barker was appointed to lead the Centre for Contemporary Visual Arts at the University: the exhibitions he has curated at Brighton have included 1996 Turner Prize-winner Douglas Gordon’s ‘What do you want me to say?’(2002), Ugo Rondinone’s ‘Our Magic Hour’ and John Murphy’s ‘Something for the Eye’ (2004) at the Regency Town House, Hove. David Green has also curated a number of innovative shows including ‘Makeshift’ (2001), involving 2001 Turner Prize-winner Martin Creed, Turner Prize-winner for 2002 Keith Tyson, Richard Wentworth and others. He has also been active in the field of photographic exhibitions, symposia and related publications, the most recent of which ‘The Unwanted Self: Contemporary Photography from the Low Countries’, was jointly organized with the University of Leuven, the Nederlands Fotomuseum, Rotterdam, and the FotoMuseum Antwerpen. However, the Gallery has shown a number of different genres of exhibitions such as a Trades Union Banners show to coincide with the Trades Union Congress held in the town in 1973, a Festival of Brighton exhibition engaging with aspects of the everyday in ‘A Common Tradition: popular art of Britain and America’ (1991) curated by Helen Martin and Andy Durr, and ‘The Lost Arts of Europe: the Haslemere Museum Collection of European Peasant Art’ (1990) for which Professor Lou Taylor and David Crowley played a central role in research and curation. BSA 35 Bringing to the fore other ‘lost arts’, Michael Tucker co-organised ‘Dream Traces: A Celebration of Contemporary Australian Aboriginal Art’ (2003), the largest showing of Australian Aboriginal contemporary art in England since the 1993 and 1997 shows at the Hayward Gallery, London and the Museum of Modern Art, Oxford. More recently, in 2007, Tom Hickey and Peter Seddon curated an exhibition at the University Gallery and the Regency Town House devoted to the work of the influential South African artist William Kentridge. Favourably reviewed in the national press, it was entitled ‘William Kentridge: Fragile Identities’, the two inter-linked venues presenting the largest show of the artist’s work seen in the UK, the majority of it never previously shown in the country. It included film, prints and installations and a live performance of music conducted and composed by Philip Miller. Also significant was the accompanying symposium, ‘Memory, Narrative, History: the Politics of Representation’, which set out to address concerns such as the extent to which figuration and narrative constitute necessary means for politically sensitized art practice? As mentioned earlier, symposia and conferences have accompanied many exhibitions from the late 1960s onwards, sometimes exploring common themes. For example, the Kentridge symposium took further some of the issues addressed in the major ‘Globalisation and Representation: Politics, Visuality, Performance, Construction, Reception’ conference (2005) organised by Anita Rupprecht, Mark Devenney and others. But museological concerns have also been a notable part of the Faculty outlook, with close relationships built up with Brighton Museum & Art Gallery, particularly by Lou Taylor, and with the V&A through Jane Pavitt’s role as University of Brighton Principal Research Fellow at the V&A and CETLD’s partnership with it. Also of note, but rather different in terms of collaboration, was the Brighton Fishing Museum, opened in May 1994, an important feature of Brighton Council’s seafront improvement scheme that was rolled out during the 1990s. As a voluntary trust, the Museum worked closely with professional partners: the University of Brighton and the Museum Service of Brighton Council. Spearheaded by Andy Durr, a Labour Councillor and member of the School of Historical and Critical Studies in the then Faculty of Art, Design and Humanities of the University, the Fishing Museum clearly embraced the idea of artefacts and memorabilia being seen as valid documentary sources alongside film and photography, just as they were in academic teaching and research. The School published a reprint of Charles Fleet’s Brighton Fishery, first published in the 1840s, and funded the making of a video compilation of historical films of Brighton seafront by Frank Gray, also a member of the School and Director of the South East Film and Video Archive (now renamed Screen Archive South East). Andy Durr devoted much time physically working on the development of the museum displays - the Dean of Faculty, Professor Bruce Brown, was also often seen helping in such tasks over many weekends prior to the Museum’s formal opening by the Lord Lieutenant of the County. The Further and Higher Education Act 1992 provided for the dissolution of the CNAA and the devolved degree-awarding power to institutions other than universities, most notably the former polytechnics, as they themselves moved to university status. Brighton Polytechnic was one of 36 such institutions; five non-polytechnic institutions also received university status, including the University of the Arts, London. The problem concerns nothing less than constructing what Britain has never had, a coherent, liberal and integrated visual education. It is arguable whether art colleges can ‘educate’ painters and sculptors, any more than universities can ‘educate’ poets and dramatists or music colleges ‘educate’ composers. In other words, art colleges should become the leaders of our visual culture – including the much neglected areas of film and television – as universities are the leaders of our literary and scientific culture. The firm commitment to the development of research over the past three decades and the bringing of the humanities into the Faculty under Robin Plummer, together with the return of architecture and interior design under Bruce Brown after an almost thirty year absence elsewhere in the university, has provided the intellectual capital to address such concerns. A number of highly significant steps have been taken at Brighton since the 1960s, sustained by enhanced and developing intellectual and material resources. These include the establishment of Screen Archive South East, the Design Archives and the establishment of the Centre for Research & Development; the hosting of the CTI (Computers in Teaching Initiative) Centre for Art and Design, the Brighton Photo Biennial, Cinecity and the National Subject Centre for Learning & Teaching in Art, Design & Communications and its successor, the Higher Education Academy: Art, Design Media Subject Centre, and the establishment of the Centre for Excellence in Teaching and Learning through Design (CETLD). Many other networks, national and international, formal and informal have also been set in place. Design Council Archive. However, the challenge for the 21st century might still be framed around the ability to deliver fully what was seen in 1968 as a projected ‘coherent, liberal and integrated visual education’ and further promote the wider recognition of academics and researchers in the Faculty as ‘the leaders of our visual culture’, underpinned by, and complementary to, the other inter-related disciplines under the Faculty umbrella that are able to flourish at a high level in their own right. The institution’s re-designation as the University of Brighton in 1992, with Professor David Watson as Vice-Chancellor, resulted in a number of fresh opportunities. Not least was the chance to bid for research funding in the national Research Assessment Exercise (RAE) to which ‘older’ universities had been able to submit (and receive funding) in 1986 and 1989. In 1992 the Faculty of Art, Design and Humanities at Brighton submitted in art and design and was graded at ‘4’, the highest in the university. It has continued to be successful in subsequent RAEs in 1996, 2001 (when an integrated Faculty submission entered under art and design achieved a ‘5’, the highest in the sector) and 2008. In Chapter 9, Bruce Brown has encapsulated many of the key events of the 1990s and 2000s and, as someone who has been involved in the development of the Faculty for more than 25 years, it is difficult for this author to provide an objective account of this recent history. Nonetheless, it seems that since 1992 there has been a discernible change in the ways in which the Faculty views itself and how the rest of the University, in turn, sees it. Success in art and design in the first round of the RAE which the University was able to enter confirmed two lingering prejudices: from the art and design perspective, there was still an aura of the notion of excellence as something that had been known since pre-polytechnic, independent art college days; from the standpoint of some other parts of the university there was still a lingering view that it was somehow easier for art and design to achieve academic and research success. Continued performance at a high level in the following two RAE rounds, with the achievement of the ‘5’ in 2001, perhaps helped shift wider perceptions. It has also boosted the ambitions of many academics and researchers across the Faculty itself. Leading the university’s agenda for further development has been Professor Julian Crampton who took up post as Vice-Chancellor in 2005. Under the leadership of Anne Boddington as Dean from 2006, with Bruce Brown becoming Pro Vice-Chancellor for Research across the University after seventeen years as Dean before her, the Faculty of Art & Architecture’s position has changed signally from the early days of university status. Since 2001 an increasing number of research links have been established with other parts of the institution that now acknowledge more positively the considerable research expertise that resides in the Faculty. Such associations continued to grow with the framing of the art and design RAE submission in 2008, embracing research collaborations with every faculty in the university. Arts and Architecture has moved away from what might have been perceived as a somewhat insular, almost ivory-towered approach to participating in a larger enterprise to a more collegiate and participatory approach that believes that, through its expertise across a range of disciplines, it can make a telling contribution to the university as a whole and build on its strong international presence.